Hot on the heels of yet another successful year, the BSPA is delighted to announce that next year’s circuit will be sponsored by PeterNicolSquash.com & Prince UK. Now in its fifteenth year the PeterNicolSquash.com UK Grand Prix will bring squash brand Prince back into a partnership with the British Squash Professionals Association that lasted over five years in the late 90s. 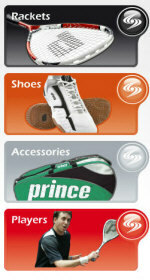 "PeterNicolSquash.com is much more than a one-stop shop for Prince products. We plan to fully support our coaches and players throughout the country, giving them access not only top quality product but also our expertise across all areas, from coaching programmes to marketing ideas. Many of our personnel will be playing in the UK Grand Prix so it made sense for this us to support it as our first foray into sponsorship." "We are delighted to be involved again with what has become the backbone of competitive tournament play in the UK. The BSPA has gone from strength to strength and we are excited by the opportunity to take it to the next level through our involvement as sponsor and through the participation of so many of our players." The circuit currently consists of 10 events across the UK from Aberdeen in the north of Scotland to Lee-on-Solent on the south coast of England. It culminates with the UK Grand Prix Finals, which now seem to have found a prosperous home at Ipswich Sports Club. There are already plans in the pipeline to expand the successful concept and to integrate an Under 23 element to some of the events. "The BSPA has always tried to look after the interests of the British players from the younger guys starting out on their professional career and looking to ‘cut their teeth’ to more experienced players whose days of travelling the globe might be over but relish the opportunity to compete in the UK and earn money whilst doing so. This tie up will enable us to introduce extra elements that can benefit both sponsors."